A dramatic final round of the 2017 MotoGP championship was held at the Valencia circuit earlier today, and Marc Marquez (Honda) came away with his fourth MotoGP title after nearly crashing out of the race (more about that later). 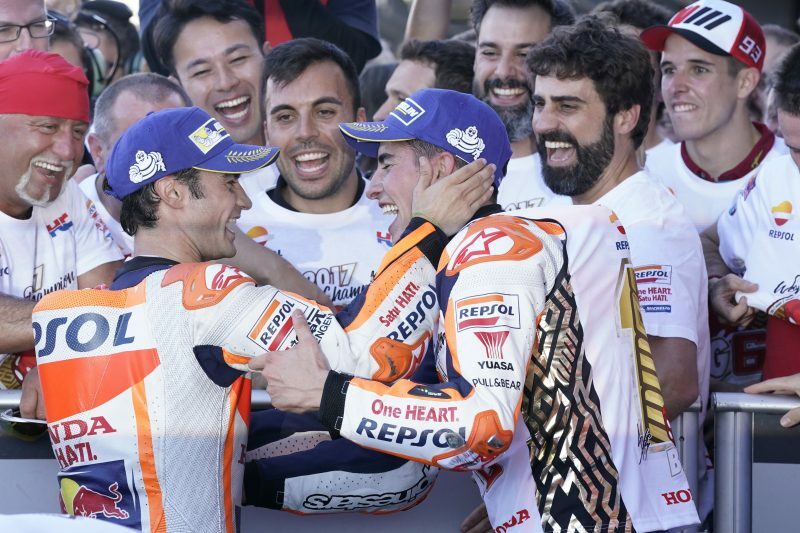 Marquez ended up with the third step on the podium behind his teammate, and race winner, Dani Pedrosa, and second place Johann Zarco (Yamaha). Both of the factory Ducatis, ridden by Andrea Dovizioso and Jorge Lorenzo, crashed out of the race, but not before creating drama of their own. Although Dovizioso appeared the faster of the two in the first half of the race, and had a theoretical shot at the title if he won, his teammate Lorenzo doggedly blocked his progress despite team orders to let Dovizioso through. Did Dovizioso have the early pace to reach the leaders? Had he been able to dice with Marquez, would Marquez have crashed out? We will never know the answer to these questions. As it stands, Marquez came through with the title after making an unbelievable save when he low-sided and was sliding on the ground … eventually propping his bike up on his knee and riding into the gravel. He then negotiated the gravel without falling over, and re-entered the race in fifth position (dropping from the lead). The two Ducatis crashed in front of him, handing him a podium spot. So Marquez ends as champion with Dovizioso second and Maverick Viñales (Yamaha) third. At 24 years of age, Marquez becomes the youngest in history to earn four MotoGP championship titles, and six World titles, overall. Follow this link to full results. For additional details and points, visit the official MotoGP site. Any more loop holes in the role book for ducati to exploit? Looks like having the fastest bike and most adored rider, is not enough to win the championship. In 2018 pre season testing, Vinales just posted the fastest time on the 2016 M1, while Zarco was second fastest on 2017 M1. IMO it was fools folly for Lorenzo to think he could help Dovi by showing him the fast way around the track (since he didn’t) and ignoring team orders (which he did). I know I’m not 99 but as soon as I found out Dovi was behind me, I’d have “run wide in a corner” and let him slip thru and then it’s on Dovi if he doesn’t win the race. As it is look at all the heat 99 is taking and the blame. Stupid stupid move on Lorenzo’s part. What an ego he must have. I thought he ran up on Lorenzo a few times in turns and it looked like he was being held up, but his bike was also moving around a lot, unusual for Dovi. He said he couldn’t pass and that he was on the limit just following him. He fell away from JL before their repsecitve crashes. It seems like everyone is bent out of shape about this except for Dovi. MAPPING-8 There is a part of me that thought back to the 2015 Malaysian GP. Marquez getting in front of Rossi and then slowing down while JLo was in the lead with Rossi close in the points. Rossi claiming the Spaniards were working together. Sure it’s one of those conspiracy claims that could be discredited by the fact no one in their right mind likes Lorenzo enough to help him. I used to hate Max Biaggi but later on cheered for him in the WSB races. I doubt that change of thought will occur with my view of JLo. What a great article. I fully agree total spin, and transparent for all to see. What a shame. Jorge just lost more of the few fans he has left. Congratulations to MM93 for this year’s championship. Dovi had a good season as well, too bad he couldn’t have been on the podium like MM suggested. Couldn’t believe Lorenzo would not let Dovi by, really can’t blame him, but team order’s are team order’s! Zarco ran a really good race, thought he actually was going to win it, until Pedrosa came by on the last lap. Thought Dovi should have finished the race, if his bike was able to, even though the championship was lost. Great season, can’t wait for next year…. Dovi says it was ok to follow Jorge and Jorge says he doesn’t move over for anyone. Well Ducati, what is your race on Sunday, sell on Tuesday ad campaign (motorcycle dealers here are rarely open Monday), nice guys sometimes finish second and not so nice guys further back, or you meet the nicest people following the not so nicest people on Ducatis…Dovi is a good sport, a genuine swell person and proved Duc could compete, but Valencia was a marketing dud for duc and yamaha. At Valencia, Honda grabbed more than the rider, constructor and team championships. They took the inspiration championship too. While nothing Dovi could have done would have won him the championship, Lorenzo did Marquz a favor by blocking Dovi. Again, as long as Marquez was 5th it didn’t matter. When Lorenzo crashed he was a bit over 2 seconds behind the leader, Dovi was then forced to make up that time in less than 1/2 the race distance. Did that cause him to crash? I guess we’ll never know. Lorenzo seemed to be paying back Marquez for running interference for him in 2015. There is no question that Lorenzo had orders to let Dovi pass, they were on his sign and on his dash, and chose not too. Hope that costs him a bucket load of cash. Congratulations to Marquez, how many times did he DNF this year and still win the championship? Vinales, Rossi, why do the Yamahas seems to be so good one race, and 10th place the next? … and why did both Ducatis both fall, almost at about the same distance, this has happened previously. Surely the track was difficult, Marquez twice sliding out, saving it both times, same corner. That Pedrosa nipped Zarco on the last lap, fantastic stuff. Who wants Zarco to be their rider next year? How can Zarco, beat Rossi and Vinales so bad, on a non factory bike? Whats wrong with the factory Yamaha’s. TV coverage, showing fans waving Rossi flags, when Rins is moving up to 4th? Marquez passing Zarco, more fan shots? There must have been technical difficulties, or just Rossi fans in the director booth. After the Ducs crashed, ok to show Dovi and Lorenzo a couple of times, but save it for after the race, they both crashed and were loosers. Pedrosa’s win, fantastic stuff. Even though he won the race, it seemed like that was overshadowed by Zarco and Marquez performances. What a race. 3 times Marquez DnF’d. Dovi and Vinales had two each, Zarco had one. Rossi, Lorenzo and everyone else had 3 or more. Anyone else wonder what the hell was up with the TV director showing shots of fans or lesser important single bike shots and not covering the passing up front during critical moments? Even Nick Harris didn’t see one of Marquesz’s major saves until moments later on replay. Terrible cut-aways at the wrong time. Worst TV direction ever for a GP race. BTW I will miss Nick Harris!!!!! Iconic, infectious, illustrious and irreplaceable. Yes MM won the championship on the best MotoGP season I have ever witnessed. His save, plowing the front and the dirt track moment show everyone he is a worthy Champ. How can you not be a Marquez fan? Never happy with any finish other than first place, riding beyond the limit, twinkle in his eyes. 4 championships at 24, if he can stay in one piece, will surpass even Ago. Dani just needs to eat more and put on a few pounds. My subscription just auto renewed today. “How can you not be a Marquez fan?” I would guess if you are the team manager for Honda, you would prefer that he ride more conservatively when the title is on the line. If he doesn’t stop riding above the limit (when he doesn’t have to), then I fear his career will be cut short by injury. All great champions have learned this truth. Here’s hoping Marquez does, too, before it’s too late. Racers gotta race, remember Kevin Schwantz? Win it or bin it, they retired his number and he had one championship and 25 wins. Q: what do you think it means? A: it means we the “Tifosi” are operating on an ILLUSION of no team orders in motorcycle road-racing when in fact they DO exist and have ALWAYS existed. which is counter-intuitive actually when you consider over in Formula 1, Ferrari makes no bones about having team orders, they’ll tell you up front. # 26 knew what to do … Fall in behind 93 at the start… Protect him from the Ducs… Don’t put any pressure on 93…. Once 93 took the detour into the sand… Go for the win. Didn’t need a dashboard or a pit board. Don’t know what 99’s problem was. that was weird, however not entirely sure that wasn’t part of the “theatre” to some degree. in one aspect Jay was ultimately proven right though, it WAS better for him to continue using his local knowledge to show Dove the fast way around. Corse’s call was maybe too early…? for as soon as Jay took a digger, Dove folded like a cheap suit. what, like “Veterans Dre” doesn’t know to hold some throttle, to keep the front from washing, to make it out of the gravel…? it was almost as if without “Agent 99” there blocking the wind, a strong gust would’ve blown him off course (putting paid to his season) with 24 laps to go instead of the 6 we were given. but of course with winning his only option, no drama/suspense in that. Notice towards the end #99 easily pulled away from #4. No way Dovi wins this race. Then they both crashed. HRC strutted it’s stuff this past Sunday. Worst teammate of all time has to be Lorenzo. When he was at Yamaha he blocked Valentino in the last race to give the title to Marquez. He did the same thing this week-end with Dovi. Who knows if Dovi could have pressured Marquez into a mistake, but seeing Marquez’s unforced error in the race when he made another of his miraculous saves, it is definitely a possibility. WTF happened to Yamaha this year? They started the season so strong and Honda was struggling mightily. After Vinales crashed at Assen everything turned around. Tech 3 better tell Yamaha to bin the 2017 bike and let them carry on with a further-developed 2016 M1. Since when did Lorenzo block Valentino to give Marquez the title? Marquez has earned ALL of this championship crowns fair and square. I too wonder if there are any JLo fans out there…..it’s tough to support that type of behavior. MM93 will never make it to surpass Ago if he keeps crashing. At some point that is gonna catch up to him (or you would think so). He is clearly awesome and a great champion. I love to see him up on the top step. Great season. I am bummed it is over but I look forward to next year. I wonder if MV25 can pull it back together over the off season. Pretty crappy end to what looked like a golden season. I guess that is why they go around the track and not give the trophy to the winner of testing. JLo might be looking for a job soon. He should’ve let Dovi thru. No problem with losing the seat. He can still make a fortune selling ‘Mapping-8’ T-shirts. And I’m gonna buy some. After Dovi’s crash and he came back to the pits, there was celebration for him, no doubt for all of his effort this year. I doubt there was such celebration for Lorenzo just next door…. by the power vested in me i hereby bequeath all visitors to MD the ability/willingness to TRUST THINE OWN EYES. whew, it’s hard to believe it’s been 3 years, but the inconvenient flip side to this is we also have 3 years of data staring us in the face. yes data, capped by BOTH Factory Ducatis unceremoniously running out of front grip and ending their seasons upside down with gas pouring out their tanks. no, it ain’t pretty. correction 2 years. in addition to Nick Harris, and Ernesto Marinelli, just learned Goubert is also leaving for new pastures. MM93 may very well surpass Rossi and Ago for the GOAT helm. 24 with 4 premiere class titles is nothing short of incredible. 7 and 8 don’t seem like numbers he can’t overcome. I’m not a fan but I do give him credit and a hat tip for his dogged determination. Rossi languishing in 6th on his 2016 chassis… wonder what he’ll do after 2018? Sadly I don’t think he has another title in him. Reflexes doing what they naturally do with time, bikes playing on such a level field, and a rash of younger, hungry competitors doesn’t make his chances look good. I plan on trying to catch him at a few races next year, just in case it’s his last. Farewell to Nick Harris too. He truly made our favorite sport into a spectacle with his breathless commentary and orchestrated the drama perfectly. He will be missed. right then Brinskee we the “motley crew” of MD request you conduct an immediate INTERVENTION on Provologna. we’ll spot you airfare to and from SLC, the hire car…? that’s on you. look do it for Pro, thank you. Why? He had the single best racing season of his life, winning *6* races (unimaginable before last year), and is walking away healthy with no injuries. Could it have gone better? Sure. Would he trade with anyone other than Marquez? NO WAY. It’s a shame Rossi and Marquez weren’t the same age. That would have been amazing racing with both in their prime. Honda won the triple – manufacturer, team and championship. Yamaha needs to know why the satellite team is doing better than factory. Ducati made a significant impact on MotoGP this season, and really weren’t out of it until the end. Suzuki did well, KTM did well, Aprilia did well, it all points to an even better season next year. Congratulation’s to Marc Marquez for winning the 2017 MotoGP championship. But,he should also be winner of the “entertainer of the year” award. Take todays race for example. The Top five riders were for many laps just staying put,very little action. Then along comes the Marquez pass on Zarco. From that point on all hell broke loose. The Beneficiary of all this? We, the fans of motorcycle racing. Ladies and Gentlemen we are witnessing something very special in Marquez. Enjoy this while it lasts. We only watch racing for one reason, entertainment. Interesting finish. Congrats to Marquez and to Dovi for a heck of a season. That crash/save after Marquez passed Zarco for the lead had me jumping up from the couch screaming. The heart of a Champion Marquez has, he just couldn’t sit back there and accept the championship, he had to go for the win. I love that. Congrats to Dani too for the win. His contract is up this year. Will he be Honda mounted next season? Gosh it’s going to be a long winter. I stand corrected, Pedrosa and Marquez’s contracts don’t expire until the end of the 2018 season. Q: Will he be Honda mounted next season? as you saw (with your own eyes) Dan only earns his keep at years end. he is under no obligation to do so at any other point of the season, and if/when Catalonia gains “rich independence”, that’ll just be icing on his “privileged cake”. LOL well he did win one at the beginning of the season as well, was on the podium 9 times,finished with more wins than Rossi, finished ahead of everyone but Champ Marquez, runner up Dovi and wunderkid Vinales. That’s not too bad of a season in anyone’s book.